It was all laid out so warmly and fuzzily in the UN’s Agenda 21 – more than 20 years ago. The peoples of the world will simply not tolerate continued environmental devastation or the persistent inequality which offends deeply held universal principles of social justice. I’ve never been a believer in the conspiracy theory of history. But …I have to admit that there have been days when I’ve wondered if the whole climate change “controversy” (for want of a better word) has been fostered (if not allowed to fester) in order to distract our attention – just in case anyone with any common sense and influence should wake up and see what we’re being lulled (or bullied!) into accepting! Consider the circus that has evolved thanks to the big players in the “climate change game” – particularly in the past few years. Certainly the recent antics of Peter Gleick and Michael Mann, along with the highly risible nonsense that passes for “journalism” in the MSM can only be described as a three-ring circus! 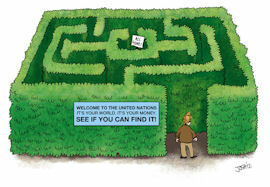 Within the maze (and there’s no other way to describe it because the multiplicity of UN websites makes it almost impossible to determine the “chain of command”), there’s a Department of Economic and Social Affairs (DESA) which has an “Office for Economic and Social Council Support and Coordination” (ECOSOC) – or maybe it’s the other way around. But in any event, there is an “NGO Branch” – here’s a link to an org chart, if you’re curious! They have a lovely glossy 49 page brochure, written in a close approximation of “plain English”. Quite a refreshing change from the plethora of other UN docs I’ve slogged through during the past few years! Lots of pretty pictures, too. No walls of words for this elite group! NGOs contribute to a number of activities including information dissemination, awareness raising, development education, policy advocacy, joint operational projects, participation in intergovernmental processes and in the contribution of services and technical expertise. Article 71 of the UN Charter opened the door to provide suitable arrangements for consultation with non-governmental organizations. The Economic and Social Council [ECOSOC] may make suitable arrangements for consultation with non-governmental organizations which are concerned with matters within its competence. Such arrangements may be made with international organizations and, where appropriate, with national organizations after consultation with the Member of the United Nations concerned. What fun, eh? But only for representatives of the 3,523 (make that 3,421, because there are 102 NGOs under suspension – because they haven’t filed their “quadrennial reports”. Naughty, naughty NGOs!). My thanks to Peter Bobroff, the wizard behind AccessIPCC, who very kindly extracted the data from ECOSOC’s “official list” for me. At this point, please consider our data – and this analysis – to be preliminary and subject to further refinement. So, in 1946, four NGOs were granted “consultative status”. 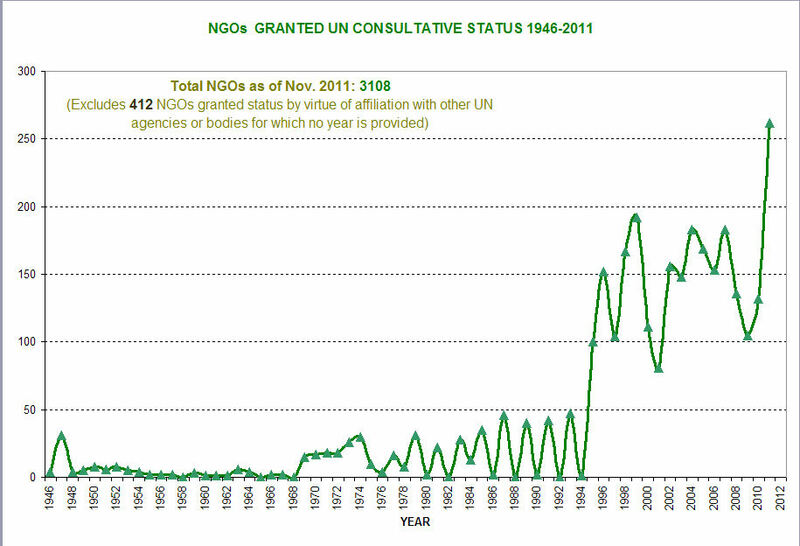 Between then and 2011, there were six years during which no NGOs were accredited: 1958, 1965, 1968, 1982, 1988 and 1992. Although it is within the realm of possibility that during each of these years a number of NGOs – who acquired their accreditation by virtue of their affiliation with other “UN agencies or bodies” – were added. The total of such NGOs, as of Nov. 2011, was 412. General consultative status is reserved for large international NGOs whose area of work coversmost of the issues on the agenda of ECOSOC and its subsidiary bodies. These tend to be fairly large,established international NGOs with a broad geographical reach. Special consultative status is granted to NGOs which have a special competence in, and are concerned specifically with, only a few of the fields of activity covered by the ECOSOC.These NGOs tend to be smaller and more recently established. In typical UN “transparency” fashion, even though 2300+ NGOs are in the “Special consultative status” category, there is no indication of the “special competence” or “fields of activity” which got them through the open door! Although, to be fair, there is an online database which may provide such details for each agency, but I have not yet succeeded in persuading the database to yield any response to my query attempts. Non-governmental organizations in general consultative status, special consultative status and on the Roster, that express their wish to attend the relevant international conferences convened by the United Nations and the meetings of the preparatory bodies of the said conferences shall as a rule be accredited for participation. Other non-governmental organizations wishing to be accredited may apply to the secretariat of the conference for this purpose. The Commission on Sustainable Development (CSD) was created in December 1992 to ensure effective follow-up of the 1992 United Nations Conference on Environment and Development (UNCED — also known as the Earth Summit), in Rio de Janeiro, Brazil, where world leaders signed the Framework Convention on Climate Change and the Convention on Biological Diversity; endorsed the Rio Declaration and the Forest Principles; and adopted Agenda 21, a 300-page plan for achieving sustainable development in the twenty-first century. […]focusing on clusters of specific thematic and cross-sectoral issues. The CSD encourages broad NGO participation. Now there’s a familiar sounding bell: the UN Framework Convention on Climate Change (UNFCCC), according to Rajendra Pachauri, the UNFCCC is the “primary client” of the Intergovernmental Panel on Climate Change. Interesting, eh? Other “functional commissions” include the Commission on the Status of Women, the Human Rights Council (and we know how well that’s been working for the last twenty years) – and the Commission on Crime Prevention and Criminal Justice. Certainly makes one wonder: did this inspire Polly Higgins’ “ecocide” campaign? Or did Higgins inspire the Commission? Perhaps the significant, observable increase in the number of NGOs ensconced in the shrubbery of the UN’s maze is the primary “forcing” of “human-caused global warming” deemed to be a serious threat to the future of our planet. I would expect that they might be generating an awful lot of hot air (and CO2, of course). Ali Babba, do you have a source for this quote?! Armstrong is known to be quite incendiary, but this is awful – even for her! I think Ali Babba’s quote actually comes from Stanley Kubrick’s Full Metal Jacket, but it does seem to capture the general tone of 10:10. My favourite Franny Armstrong quote is “My carbon footprint has shot up since I’ve become a successful campaigner”. The UN and its 1001 NGOs remind me somehow of a fertile and complex ecosystem, all nourished and supported by a majestic river like the Amazon – or, in this case, a majestic river of our cash! You win a free pass, exempting you from Franny’s final climate solution. Heil Franny! is more than a bit disturbing. Good work Hilary – keep digging. We’ll have to deal with this lot eventually. The UN, and bureaucracy in general, serves at least two mighty purposes; one is provide employment and the other is to ensure the emergence of a condition which I call “Regulation Deficiency Anxiety Syndrome”. In this state the “victim” is rendered unable to think for them self and pleads with outstretched arms for guidance. “As the architect of the United Nations Environment Program and the United Nations Development Program, (UNEP-UNDP), Strong had for many years co-ordinated and strengthened the integration of Non-Governmental Organisations, (NGO’s) into the UN environmental bodies. In Geneva in 1973, he launched the “World Assembly of NGO’s concerned with the Global Environment”. He realised that for his ambitions of a UN world government to become reality he needed the vast networking opportunities offered by the NGO’s, now referred to as “Civil Society”.